What is another word for polished? 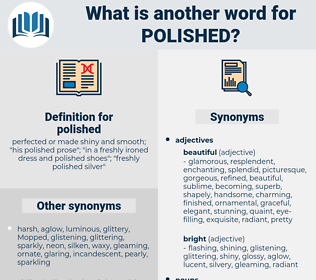 perfected or made shiny and smooth; " his polished prose"; " in a freshly ironed dress and polished shoes"; " freshly polished silver"
finest, best, better, refined, sophisticated, courteous, rude, bright, brighter, tapered. clumsy, unvarnished, illiterate, large, polyester, unintelligent, heavy, thick, lackluster, immense, blunt, philistine, great, huge, unfinished, unprocessed, rude, provincial, ignorant, uneducated, big, backwoods, vulgar, unlettered, naif, naive, stout, flat, ill-mannered. It was polished up for my poor mother - whom no doubt I saw in my youth, but took no notice of. The first who arrived was Professor Hochstedt, a large man with cold and stately manners, who expressed in polished terms the pleasure which he felt at the doctor's safe return.